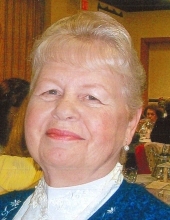 Dorothy Louise McGuffie of Commerce Twp, Michigan, passed away on April 5, 2019 at the age of 75. She was the loving mother of Art (Jay) Johnson and Tom (Darlene) McGuffie. Proud grandma of Christine, Emily, Lauren, Morgan and Maggie. Also survived by dear brother John Nuoffer. Dorothy's family will receive friends for visitation on Wednesday, April 10, 2019 from 3-8 pm at Lynch & Sons Funeral Home, 340 N Pontiac Trail (3 blocks south of Maple Rd) in Walled Lake. Her life will be celebrated with a Funeral Service Thursday, April 11, 2019 at 10 am, with in state 9 am, at St. Matthew Lutheran Church, 2040 S Commerce Rd (between Pontiac Trail and Decker) in Walled Lake. "Email Address" would like to share the life celebration of Dorothy Louise McGuffie. Click on the "link" to go to share a favorite memory or leave a condolence message for the family.